Once in a while God arranges the pieces of a church-planting story in such a dramatic way that when you hear it you just know that something very special has happened. The Orthodox Presbyterian Church has a new congregation in St. Louis. 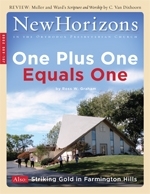 But the story of how Christ Presbyterian Church (OPC) in Hazelwood, Missouri, came to be received by the Presbytery of the Midwest on April 6, 2008, is one that is truly unique. Three years after the Orthodox Presbyterian Church began in 1936, Marie Kuiper, wife of Westminster Seminary professor R. B. Kuiper, presided over more than 125 women who gathered for the organizational meeting of the Presbyterial Auxiliary of the Presbytery of Philadelphia. The gavel she used to adopt the constitution was constructed from the wood of a Chinese idol. After a violin solo, the Rev. Henry W. Coray spoke about his five years as a missionary in Harbin, Manchuria.